An English Homestead: Are Sheep Worth It? The sheep are causing me trouble again this year. I seem to be having a run of bad luck with them lately, but this week has been particularly bad. One for the sheep managed to get into the lamb creep, where I've been feeding the lambs a mix of rolled oats, barley and beans. This feed is great for the lambs as it reduces their dependence on their mothers whilst still allowing them to fatten quickly. Unfortunatly when this ewe got in there it didn't know when enough was enough and ate more than it's fill. It then got out and drank loads of water, this made all that grain in it's stomach expand and ferment. When I found her she was pretty unresponsive, couldn't get up and was bloated. I tried everything to get the food and gas out, even giving her a drench with bicarb, oil and water which is meant to help get rid of the gas. I also made her swallow a plastic tube which is meant to do the same thing. Unfortunately, although I tried my best she still died. Apparently the stomach keeps expanding and crushes the major organs. This hasn't set me in a great mood for the week. 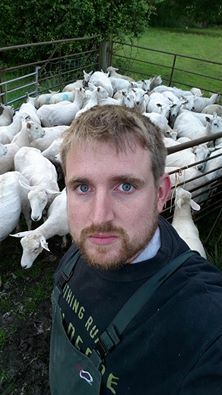 Sorry for the selfie, this was taken at nine on Friday night after I discovered orf on some of the lambs. Then when checking the sheep the following morning there's a lamb looking sorry for itself, it's sick with something and to make matters worse there's the early signs of orf; a scab in the corner of his mouth. Orf is a perpetual pain with sheep as it'as easily spread around the flock. That meant that Friday night I had to get them all in and go through the lambs to make sure not too many had it. Not how everyone wants to spend their Friday night I'm sure! The lamb is now on a course of treatment and looking a little better, but it'll probably still die! I also had to do the second course of vaccinations for the lambs this weekend. With so much work and so little return I do frequently questions if they're worth it. That said I do enjoy having the land and when I'm not working full time and my work load is lower the jobs won't seem s quite so bad. What do you think? Would you keep sheep if you had the chance? 4 is more than enough for me along with everything else, I have said no flocks until Martin is here full time, livestock do seem to come with never ending problems but they are soon forgotten when things go well. Other than raising a couple of spring lambs to butcher in the fall (the meat was wonderful, we both do enjoy lamb), we've not had any experience with raising sheep but, gosh, they do seem to have their own set of difficulties! I read about problems from lambing to diseases easily contracted. I'm sure there are lots of good things about raising them, but I'm not eager to get into raising them myself. Sorry to hear you've had a run of bad luck with yours. That must have been a huge amount of grain. We have had a ewe get into the grain cans occasionally, although not in quite a while, and eaten huge amounts of grain and not bloated up that much. Maybe it was the different type of stuff you mentioned like beans or something. It seems to me once you get above 20 or so ewes you will always have some issue.We ended up losing a whether lamb this year from tetanus after castration day even with the vet doing it. Last year we lost two prime breeding ewes to BArberpole worms and that was the worst year we have ever had. I like our sheep though. As things decline more and more they become more valuable every day along with the experience. My people wanted to put a few in one of their paddocks, but were advised not to; they said they'd be more trouble than they're worth. I think the advice was correct. I have heard the horrors of Orf in other countries. I'm in the U.S. and I have had my first bottle lambs get what I'm pretty sure was Orf (bloody sores, like cancer sores on their lips and gums). It didn't seem to bother them at all. Then it went through our goats, and again it didn't seem to bother them. The next year we had a bunch of baby goats get blisters on their behinds that was treated/ dried up very fast with a few wipes of dairy teat dip solution. I read that it also was a form of Orf. One thing I have always made sure of is to get minerals with copper in them. I have read in Natural Sheep Care by Pat Coleby that sheep do need copper and that it will prevent them from developing many of these nasties. So many people are afraid of copper, because there are so many warnings, but they still do need some and unfortunately a lot of commercial sheep minerals leave the copper out altogether to keep fearful customers happy. If you don't already have Pat Coleby's book, its a definite for the bookshelf. Its packed full of lots of information. Sorry you are having problems. Sheep have too many problems for me. I would rather have pigs. Or buy lambs and grow them on. And never over winter them or keep ewes. We raised Targhee sheep, bred for our desert conditions and rarely get sick. Have never had or even heard of Orf. I think different breeds do well in different areas. We love sheep, although they do seem to have suicidal tendencies, seems like. We love their hand spinning fleeces and the taste great. If you love lamb chops, you should keep a few ewes. I think they sound like a lot of trouble, but I'm not at all familiar with the raising of them. After having Will's sheep and lambs in our field for the past two years I think one day we might have a couple for ourselves, if only to eat the grass in paddock and the orchard and eventually end up in the freezer. But no more than 2 or 3 for sure, I've seen the work involved. Gosh, what a run of bad luck! I remember keeping lambs (orphans which we had slaughtered that autumn) and being so paranoid about bloat that I woke up at midnight every night to massage their tummies! They are precarious things, sheep, and no matter how carefully you watch them, they seem to spend their days thinking of ways to kill themselves.